Relax and experience the luxurious comfort and personal service at one of the leading beach resorts. 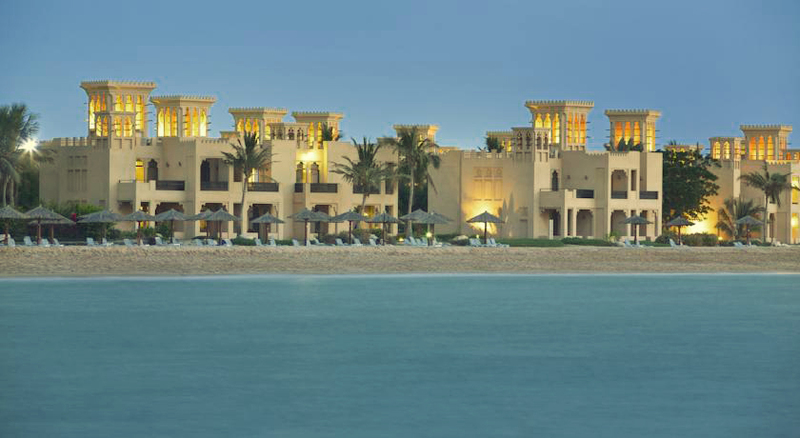 The Al Hamra Fort Hotel and Beach Resort is located along stunning white washed beaches of Ras Al Khaimah surrounded by beautiful landscaped gardens and swimming pools. Experience the luxury of Arabian hospitality with 5 star comforts surrounded by the warmth and beauty of nature. The Al Hamra Fort Hotel and Beach Resort is located a mere 40 minutes drive from Dubai International Airport and downtown Dubai, and only 10 minutes from the nearby Ras Al Khaimah city center. Nestled between the majestic Hajjar Mountains and the warm blue ocean, the hotel captures the essence of Arabian heritage, with a magnificent private beach stretching over 1.5km and offering guests a variety of water sports, with 3 large swimming pools, laid out in the landscaped gardens. The Beach Resort is situated adjacent to the majestic seven-star Palace Hotel of Ras Al Khaimah, and is only 400 meters away from the enticing Golf Club of the Al Hamra Village Golf Resort. The Hotel is ideal for leisure groups and business travelers and is a perfect getaway from the hustle and bustle of city life. Individually controlled air conditioning system. South Travels is one of the finest and Most Reputable Online Travel Agency in Dubai United Arab Emirates, with more than a decade of experience in providing quality travel services for leisure and business travelers worldwide! We are committed to establishing and maintaining the highest standard of integrity and customer service and we will remain committed in our business ethics, putting first the needs of our clients.